We have Twin, Double, Triple, Quad and dorm rooms available. 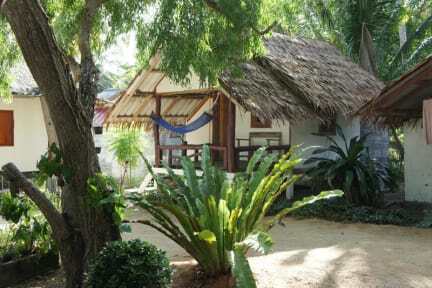 All rooms have air conditioning and ensuites with hot water. Our friendly Thai and Western staff will make sure that you have an amazing time. And whether you want to relax, party or explore the island, Sarana Bungalows is the perfect place to stay on Koh Phangan. - Relax by our amazing pool with a cocktail. - Chill out in a hammock and use the free WiFi. - Get a massage on the beach. - Go snorkelling, kite surfing or sea kayaking. - Visit one of the nearby waterfalls or go elephant trekking in the jungle. - Party at the world famous full moon party, which is only 10 minutes away. - Enjoy delicious Thai or Western food at our restaurant. - Feel safe and secure. We've got CCTV and staff on site 24 hours a day. - Get help to book onward travel from our friendly Thai and Western staff. - Play with our fur babies, Dave & Rosie - they love cuddles! 1.Our check in time is 13:00p.m and check out time is 11:00a.m. 2.We request 7 days advance notice for free cancellation. 3.We accept cash payment upon arrival. 4.Reception is open from 9am-9pm. Early check outs and free luggage storage is available. We are TAT Licensed and can help you to book any onward travel.